We are a company for the kids! We strive to make affordable everyday products, that makes life for kids, more exciting! And life for adults, easier! Our newest product, the Ultrasaurus Dino Taco Holder, is the best way to feed any dinosaur loving kids! This Grub Keeper, gets the children focused on the food during meal time. -EQUIP THIS DINOSAUR with 2 tacos and let your kids ROAR as they eat! -TAKE TACO TUESDAY to the next level, by bringing in a creature from the prehistoric era! -100% SAFE: HIGH DENSITY ABS PLASTIC, to never put your child's safety at risk. -Safe for the DISHWASHER too! Our high density plastic can take the heat and the pressure! UPGRADE YOUR KITCHEN GAME: by commissioning a dinosaur, a Ultrasaurus ...to carry two of your favorite tacos on its back. The Ultimate Taco Holder! 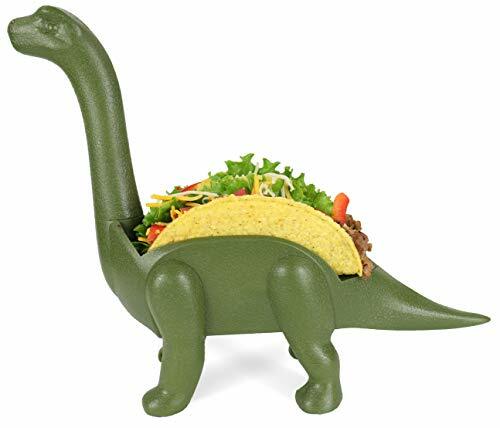 GREAT GIFT FOR THE TACO LOVER: great gift for kids and adults that want to add prehistoric fun to the kitchen table. Let them bring the fun of Jurassic to your next taco tuesday! COMPLETELY FOOD SAFE: All GrubKeepers are BPA free, lead free and phthalate free to meet or exceed all current safety standards. FAST AND EASY ASSEMBLY!!! DISHWASHER SAFE DESIGN: Our Ultrasaurus taco holders can withstand the high heat and pressure of a dishwasher! NO QUESTIONS ASKED RETURNS: we stand behind our products 100%, that means if anything comes defective, we send you a new one or offer a 100% money-back guarantee. If you have any questions about this product by Grub Keepers, contact us by completing and submitting the form below. If you are looking for a specif part number, please include it with your message.